A classic sofa is timeless. It pulls a room together, serving as both a focal point and an inviting place to cuddle up with a good book, a glass of wine, or fine conversation. It is always an upgrade! To help you find the best classic sofa, we researched a variety of new and best selling products. 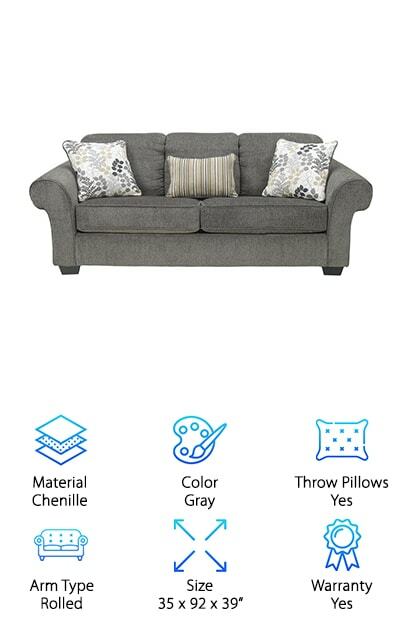 The result is the list of traditional sofa reviews below. Now: Before we get started, here’s what you need to know when shopping. Material: While each of our top ten best sofas to buy looks fabulous, they come in a variety of materials. Some are leather or faux leather. Others are fabric or fabric blends. They have very different appearances, so take note! Color: Many of the traditional shades for the best sofas for families are included here. Soft heather and deep charcoal grays, browns of every persuasion, black and even some unusual color choices are represented too. You will find a perfect look. Throw Pillows: Many of our sofa selections include a couple of matching throw pillows. Some are even reversible! This takes one more headache out of your way and assists you with decoration when your brand-new purchase arrives. They look pretty, too! Arm Type: There are lots of sofa arm types available: Track, ruched, key, modern English, pad, shelter and pleated just to name a few. We detail the arm type for every sofa on our list so you know how it will feel. 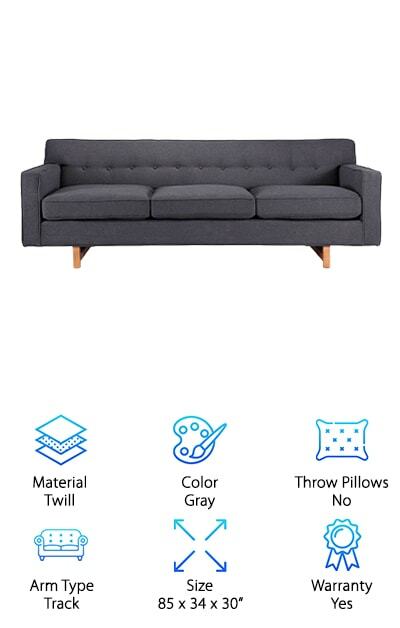 Size: The dimensions of the sofa you pick out are important. It determines how and where you will be able to place this piece when it arrives at your home. We picked out ten sofas of all different lengths and depths. Warranty: If the warranty category includes a “yes,” that means you can contact the company with any potential issues after your item arrives. This is a valuable note, since buying furniture is often a lifelong investment. Check here before you buy. Now that you know how to find the best prices for sofas by hunting through our list, it's time to go shopping. Here's the deal: If you're in a hurry, look at our reviews for our top pick and our budget pick. Both are fantastic products and are among the very best sofas we found. Right below, you'll find the runner-ups. 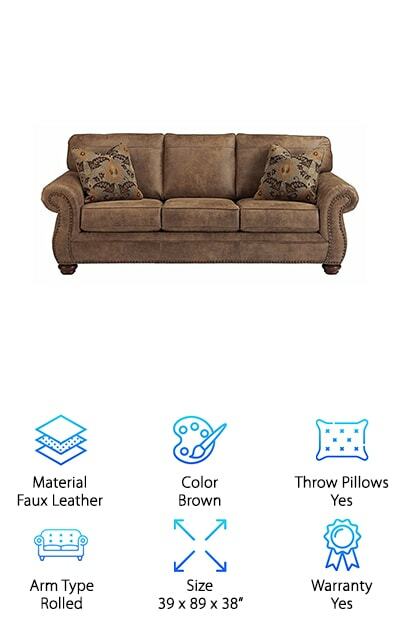 If you're looking for the best leather sofa reviews and the best fabric sofa reviews, they are here! A great sofa blends in with its surroundings effortlessly. It looks like it belongs there. You will feel that way about this hugely popular Ashley Furniture Traditional Sofa. The Larkinhurst in "Earth" isn't just a sofa. It is also a sleeper sofa, with a queen-size bed. It has a corner-blocked frame, a tight back, and reversible seat cushions. Exposed feet and a faux wood finish help to show off the distressed leather look. Foam cushions are durable and wrapped with attractive corded trim. The color can best be described as a light chocolate. As for the bed, it is a queen innerspring mattress sitting on top of a steel frame. It is easy to lift out and arrange for a last-minute overnight guest. In fact, the process to get it out is known as the easy-lift mechanism. Ashley Furniture offers a one-year warranty on all of their beautiful products. Check out their matching recliners, too. It creates a lovely set! A loveseat is technically a small sofa, designed to comfortably fit two people sitting parallel to each other. Not only will our budget pick seat you in fine repose, it will also have you oohing and aahing at the quality you receive for such a low price. The Serta RTA Copenhagen Collection includes sofas of all sizes, but we really liked the generously-sized loveseat, measuring 61 inches long. It comes in a number of warm, inviting colors, including marzipan (a soft, light brown,) brindle bronze (a glowing dark brown,) gray, and oatmeal. Quality hardwood is used to support your back and legs. Memory foam and pillowed back cushions will keep you happy and look elegant against the backdrop of any room. Two matching throw pillows are also included. The fabric is polyester, with multiple textures and appearances. The arms are rolled. You can match this loveseat with a Serta sofa, sleeper sofa and accent chair for a complete look! Secret storage spaces are always a bonus with a furniture purchase, right? The space hidden inside this Divano Furniture Linen Sofa is both generous and helpful. No one will ever know it is there until you point it out! The entire seating section of this sofa lifts upwards to reveal a large rectangular storage area, perfect for everything from toys to books. This is a large sofa, measuring 77 inches long. It is made from linen, which is easy to keep clean. The gray color will match décor flawlessly, and blend in with style. The rolled arms have nailhead trimming to lend a decorative flair. And did we mention how soft this couch is? You will soon find yourself stealing naps and taking up habits that involve sitting, like sewing and macramé. 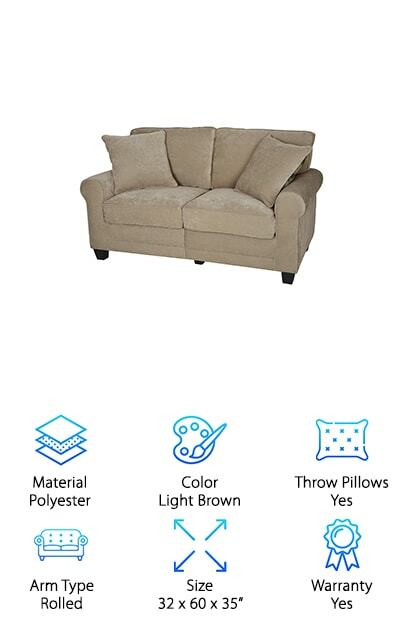 People will assume this is a much more expensive couch – it’s an awesome deal for your budget. Divano Furniture also offers a 90-day money-back guarantee. The Chesterfield sofa is an iconic piece. Usually, when people say they are getting a Chesterfield, you picture a dark sofa with intricate accents and a low backrest. The cushions are firm, but not uncomfortable. Our reviewers selected the BD Home Furnishings Classic Sofa because it is a true and proper representation of that British style. 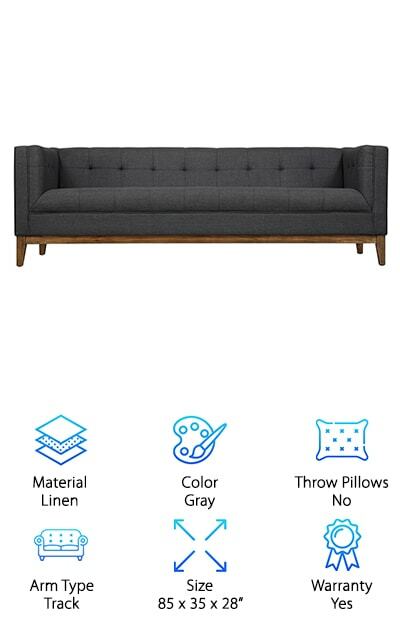 This is a dark gray or ash gray linen couch, measuring 90 inches long. That is one of the biggest sofa options on our top ten list. The arms are tufted and rolled, and there are deep button tufted accents across both the backrest and the front. The cushions are attached by Velcro to the base, so they stay put. The dark wood legs need to be screwed in when this sofa arrives, and then you are done with assembly. This couch makes a statement, but it is still easy to clean. A little elbow grease and dishwashing soap will remove most stains. 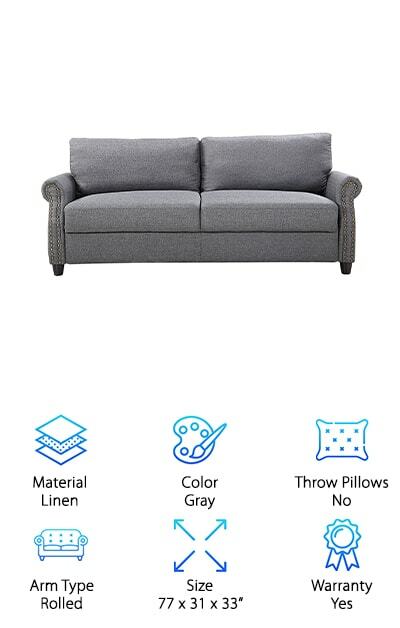 When you purchase a sleeper sofa, you are getting 2 items at once. You want to buy both an accommodating sofa and an adequate bed, but that combination can be hard to find. That's why our reviewers had to include the American Furniture Classics Sofa on their list. It is made of wood, microfiber, cotton, and leather. 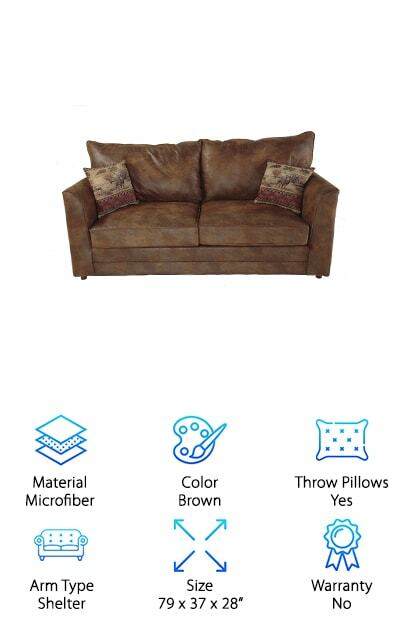 The microfiber gives the couch a stunning leather look without the high price point. It is rustic and elegant, and it will look good in a cabin next to a fireplace, or in a mansion sitting room. The color is a deep palomino brown. The seat and back cushions are solid foam, wrapped in microfiber. You will also receive two matching throw pillows. The arms are shelter style, and they will be very nice for either your arms or your head. The sleeper is a queen-sized bed and opens with a Leggett & Platt mechanism. The mattress is a quilted top on a steel frame. The Samuel Sofa Collection from Coaster Home Furnishings is a décor addition you can count on to attract rave reviews from your guests. It achieves that rare combination of comfort and discernment you look for, but often don't find, in such a large item. What are we talking about? The charm of the Coaster Home Furnishings Sofa lies in the detailing. It is made of premium bonded leather. The durable, padded leatherette has that bonded leather backing. It all sits on a wooden frame and a spring base. Both the back and the seats are tufted. The cushions are attached to the seat and the back. The track arms are slightly tapered, and the wood feet are exposed. It measures a generous 85 inches in length, and each sofa cushion is 20 inches deep. That provides enough room even for a large adult. It is hard to find an affordable leather sofa, and this is one of the best. Interior designers all follow some cardinal rules. One of them involves furniture: Always make sure that furniture is both attractive and accommodating. If something is pretty, but it is torture to sit on, you will be left with unhappy clients. That is why Ashley Furniture has such a stellar reputation, both online and in the showroom. The pieces they craft last a long time, look great, and are a lot of fun to use. 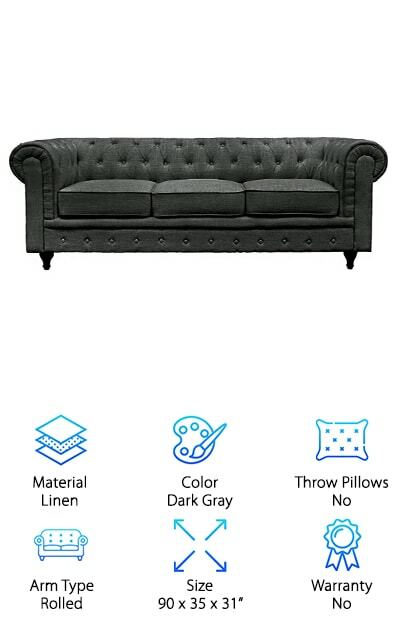 We loved their Makonnen Sofa in charcoal gray. It comes in their classic style, with only minor assembly necessary. A screwdriver is used to remove the shipping cleats, and you’re ready to go! It gets better: This contemporary sofa is upholstered in the softest chenille. The rolled arms are plush, to cradle arms and heads. The corner-blocked frame and pocketed-coil interior will hold up to years of heavy use. A large family will all fit on its 92-inch length. You even receive 3 upholstered pillows to match. A good couch pulls a whole room together. It invites the people in that room to gravitate toward each other, share a drink, and share a laugh. It can transform the dynamic in an instant, so it is pretty important to pick the right one when you are furniture shopping. We think the TOV Furniture Classic Gavin Sofa is the “right one,” for a whole host of reasons. Furniture artisans create this entire sofa by hand. They begin with a wood frame, dried in a kiln. Both the trim and the legs are made from brown antique ash wood. On top, the upholstery is made from fabric. This charcoal gray linen is highlighted with button tufting and track arms. Each sofa measures 85 by 35 by 28 inches and weighs 109 pounds. While we liked the gray the most, it also comes in beige and a sky blue. Enjoy a luxurious experience in your own home with this classic selection. The modern look is sometimes equated with discomfort, but that should never be the case! Here is proof that modernism is synonymous with relaxation: The Kardiel Kennedy Classic Sofa from Kardiel. If you are wondering what makes furniture “modern,” it has to do with the shape. This sofa has a mid-century cube construction, with lower track arms that end where the back begins. You will love sitting down onto the hardwood box frame, topped with reinforced cushions. This couch is put together so well because it is stitched and crafted by hand, a rarity in today’s machine age. There are tufted button sections on the back. The cushions are filled with multi-density foam, with the seats filled with down feathers. They are removable, and the covers can be removed and washed, which is a big plus. The fabric itself is twill, a blend of linen, cotton, and nylon. Kardiel includes a 3-year limited warranty on all of their products. The best rated leather sofas are here on this list, and this one is a favorite of ours. Why? Because even big families are able to take advantage of the Divano Roma Sectional. Movie nights will never be the same again because 6 family members can fit comfortably on this very large couch. 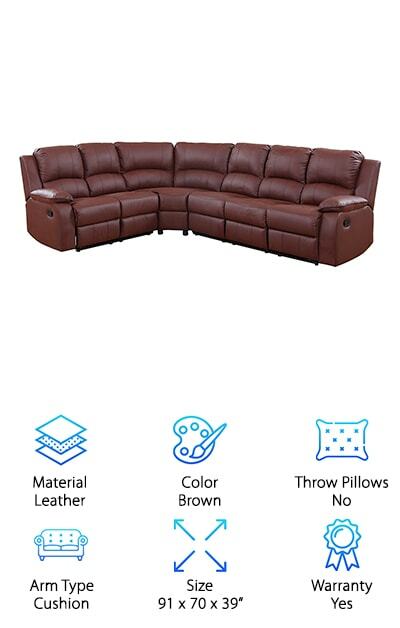 This is a bonded leather couch, crafted into two sections, which is why it is called a sectional. They fit together to form an "L" shape, so it will fit very nicely in the corner of your living or sitting room. The leather is dark brown, with overstuffed padded seats, and cushioned armrests. This is the kind of product that stays in your family for decades, only giving more pleasure as the fabric gets a little worn. And don't forget: Both end chairs recline. Grandpa can take a nap, dad can watch his football game, and the whole tribe can gather around this sectional on holidays.